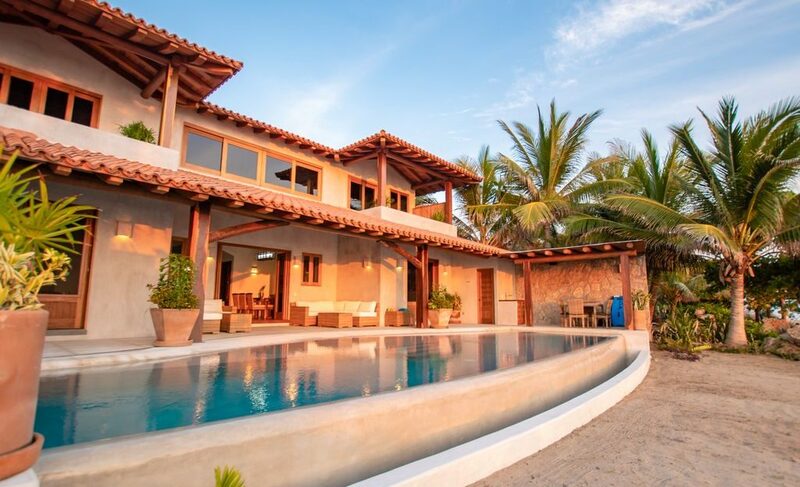 Our luxurious beachfront villa in Trocones, Mexico offers you, your family or your group a gorgeous utopia in which to recreate and relax. La Nueva offers 3 master suites. There is one king size, master suite on the upper level with a full bath. Also on the upper level is an office/study that can be converted to another queen bedroom for two; please note there is not a dedicated bathroom for the study when used as an extra queen bedroom. The lower level has two king size, master suites with full baths to include outdoor “rain forest” showers. Additionally, there are 3 full baths and 2 half baths on the property. The gourmet kitchen is fully equipped for the preparation of your meals along with an outside barbecue and poolside bar for your entertainment. 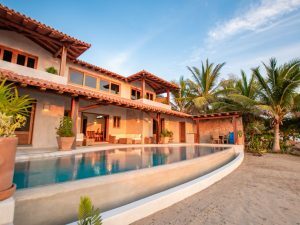 The grounds also include an infinity pool, tropical garden, and gazebo, as well as being on the beach if you want to put your toes in the sand. This Troncones Villa is staffed with a full-time housekeeper and groundskeeper. An English/Spanish speaking property manager will greet you and is available should you need additional assistance.